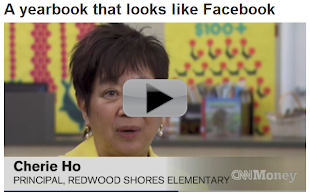 CBS San Francisco (KCBS) news covers TreeRing's no-cost for school, customizable yearbooks at St Timothy School in San Mateo, CA. Interview with TreeRing co-founder, Aaron Greco, St Timothy School Principal, Monica Miller and Teacher/Parent Margaret Flynn. MESA, Ariz. - It's the classic yearbook picture you have to love - but wouldn't it be nice to have more than just the one picture? A new yearbook company called Tree Ring allows parents to add custom pages to their child's yearbook - anything from the first day of school to their favorite pets. Red Mountain Ranch Elementary school is Mesa is trying it out this year. "That's been the biggest challenge for us..is to try to include every student..more than just their individual portrait," said Red Mountain Ranch's Brenda Sibley. "I thought it was pretty cool because then you can finally have your own personalized yearbook," said Chloe Smith. SACHSE, TX - We talk online, bank online, and stand in line for hours for the latest digital gadget. Now the school yearbook is finding its way online. More North Texas schools are making their memories digital. On any given day, you can find Karen Andiel on the campus of Whitt Elementary School in Sachse. Andiel is like most PTA moms. She always has a camera in hand, and is ready to capture on film the moments of her children's lives. But many of the pictures she takes these days include more than just her children. Andiel is the yearbook editor for Whitt Elementary School. "I've had so much fun. I'm getting to be at the school a lot, and getting to know the kids and the teachers and the office staff." No cutting, or pasting, or printing involved. Just upload a picture, click and go! "With Facebook and the iPhone, everything is so computerized and so digital. It's pretty easy for everyone to figure out, because we're doing it all the time," says Andiel. Whitt Elementary is one of a several North Texas schools making the move from hardcopy to digital. "Just drag and drop it on the page," says Brady McCue. McCue is co-founder of TreeRing, a web based system for online academic yearbooks. "We allow parents to go on our site. They can quickly upload photos and create as many pages as they like." School administrators say the digital switch makes financial sense. In the past, schools would order hundreds of yearbooks. Many would remain unsold, leaving the school with a hefty bill. Whitt Elementary principal, Jonathan Slaten tells us this move is perfect for 2010 parents. "They're doing Facebook everyday," says Slaten. "They are doing everything digitally, and they fully expect that this be digital too." Karen Andiel has kept all her yearbooks, and often shares those memories with her daughters. It's an experience she hopes to replicate for them. "I want them to show their kids and laugh at their pictures. Laugh at the way they did their hair, and what they were wearing. It's fun, it's great."